Differential considerations are based on the age of the patient. 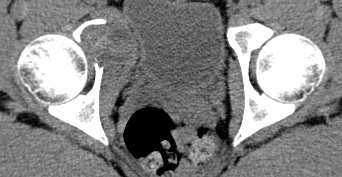 In addition to aneurysmal bone cyst, lucent pelvic masses in a young patient may represent Ewing sarcoma or Langerhan Cell Histiocytosis (Eosinophilic granuloma). In an older patient, metastatic disease and myeloma may have a similar appearance. Fluid fluid level is a non-specific finding that likely represents a blood filled space. 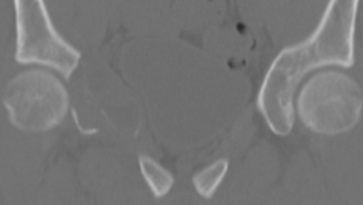 These can be seen in secondary aneurysmal bone cysts related to certain osteosarcomas and other lesions.